It never ceases to amaze me as to how quickly these puppies grow! 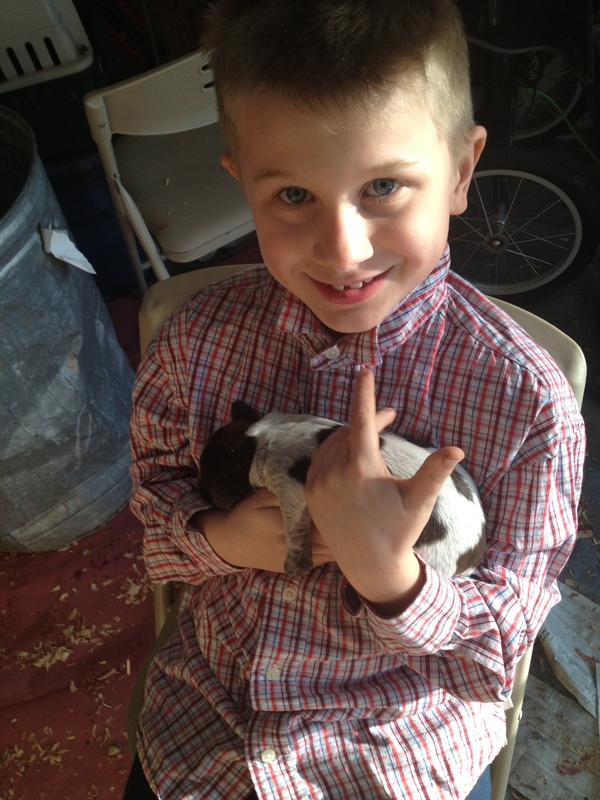 They’ve gone from the size of bratwursts to the size of really fat guinea pigs in a week. Good job mama Sue! I have registered the litter with the AKC online and have sent the litter registration paperwork to NAVHDA via mail. Just to make sure that my future owners are clear, I will give you the paperwork to register the dog individually, as I have not built the individual puppy registration into my price. That also gives you the right to register your dog with whatever name you would like, I only fill in the kennel name “Bluestem” at the front. I also want to make sure that everyone is clear: these dogs leave with “limited” AKC registration and “breeding restricted” NAVHDA registration (which is normal for reputable breeders). If you wish to breed your dog down the line, there are additional hunt testing and health clearance steps that we will go through. Contact me for details. Also, if you are an individual shopping for a puppy, I have decided to stop taking reservations for this year’s puppies because I feel as if I have a full roster. If Mae has more than 9 puppies (which the current number of reservations I have for her litter), I will let everyone know. Otherwise, feel free to call or e-mail if you would like to talk about next year’s breeding plans. As far as the puppies go, about the only things they are doing right now are eating and sleeping. They are just getting old enough to where I can let the kids hold them. Mae is doing well and getting bigger, I don’t have a picture of her for this week as of yet, I will work on that over the weekend and try to get something up either Sunday or early next week. Charles is headed down to Branched Oak Trial Grounds this weekend to run BB and Sam in Senior Hunter on Saturday and Sunday at the German Shorthaired Pointer Club of Lincoln’s Spring AKC Hunt Test and Walking Field Trial. Joining him on Saturday will be Rick and his 9 month old puppy “Dottie” from Sue and Sam’s last litter (the “D” Litter of 2012), who will be giving the Junior Hunter course a shot. Sounds like it is going to be a rainy one, but I hope to get some pics of everyone up by the clubhouse. So send us good vibes for success on the hunt tests and continued health with the puppies! Do not hesitate to call me at (402) 682-9802, e-mail bluestemkennels@cox.net, or just leave a comment on this page if you would like to get in touch. I took her temperature again three times on Monday, each time it was between 98-99F. They say that when this happens, the puppies come within 24-48 hours (and since I’ve been doing it, it has been true). I just use a human ear thermometer to take the temperature in her ear. I am sworn to never do a rectal temp on anything, man nor beast. Tuesday morning we started walking the yard and property quite a bit. 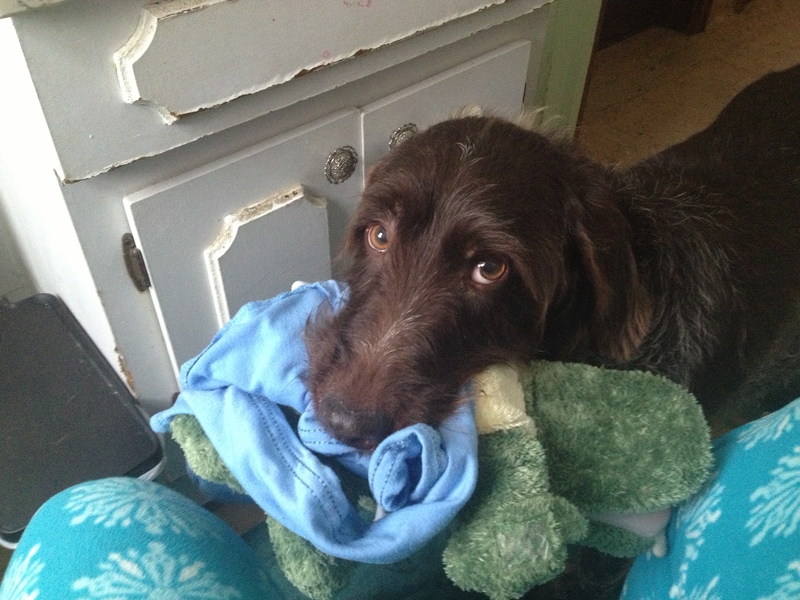 When I went to make lunch, Sue was hanging out next to me in the kitchen being her normal self: head up looking at me and tail wagging. All of a sudden her head dropped and turned away from me, her tail stopped wagging, she let out a low groan and I saw the tightening of her puppy belly. So we walked and walked and walked all afternoon. About 3 PM she started going into the “poop pose” with nothing coming out pretty frequently. She began nesting in the dog houses and in the leaf piles under the bushes. But her water hadn’t broken yet and I had an early evening obligation, so I put her in the whelping area and was away until about 7. 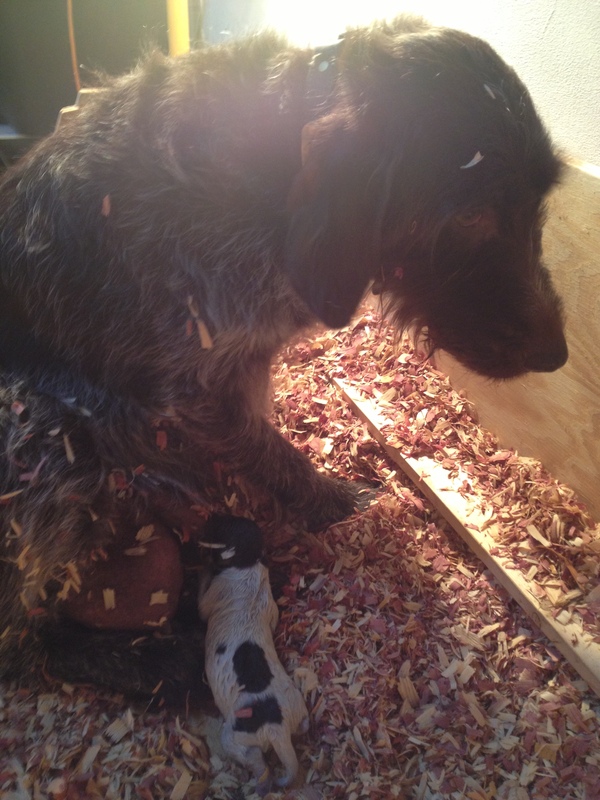 When I got home, she had been asleep in the whelping box and nothing had happened. So we walked some more and her contractions seemed to be getting stronger. A black sort of mucus plug looking thing came out while squatting at one point, but still her water wasn’t broken yet. It was time to put the kids to bed at 9, so I put her back out in the whelping area around 8:30. The kids took awhile to get around for bed, so I didn’t get back out there until around 9:30 PM. 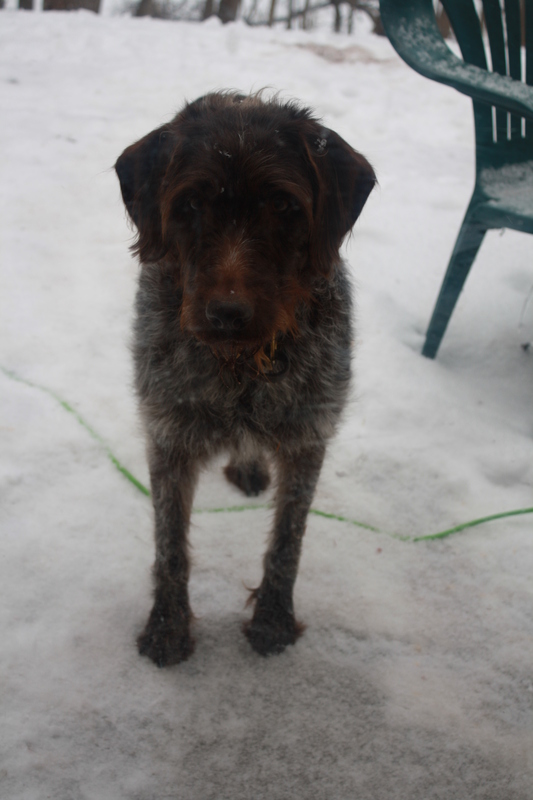 I was all dressed up to take her back out walking, but this time I had a towel and a flashlight in case she accidentally popped a puppy out on to the snow. 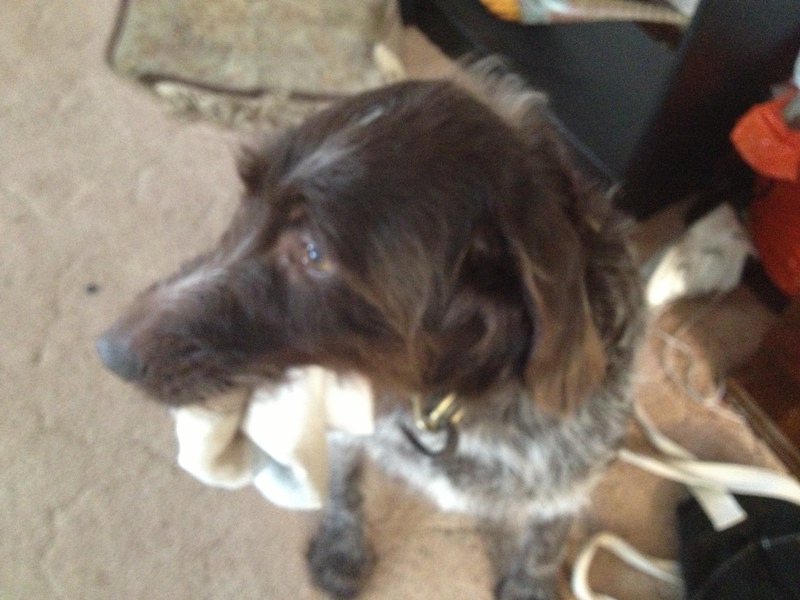 But as I was walking to the door of the room, I heard the distinct sound of a puppy squeak! I threw down my stuff and tore off my outdoor gear. She had made quick work of things because I could see where her water had broken while waiting for me at the door, but she was in the box with her first puppy. Having given birth naturally to three children under the care and observation of a nurse midwife very much influences my practice as a puppy whelper. I totally see myself in the role of the midwife: checking on the mother regularly, but assuming that our bodies know what to do and that mother nature will make things happen properly. So I give my females plenty of space to do their work bringing life into the world. 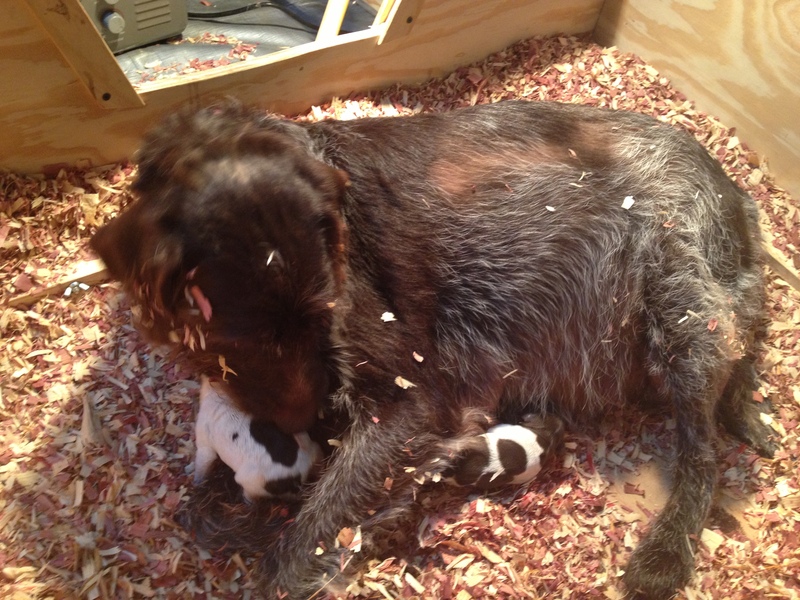 I checked back with Sue around 11 PM and puppy number two had arrived. I went and grabbed a couple more hours of shut eye, but Sue was hard at work between 11 PM Tuesday and 1:30 AM Wednesday, as by my check-in she was up to 6 puppies. 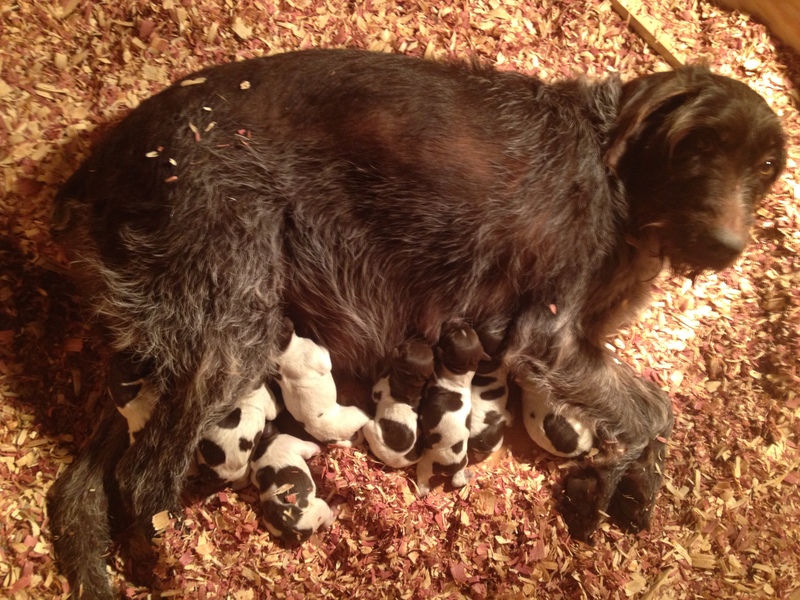 Sue with 6 puppies at 1:30 AM Wednesday (there is one under her front leg). By the time I was up again at 4:30 AM, two more puppies had arrived on the scene, for a total of 8. I was able to get Sue up to go outside to go potty and I checked her stomach and thought she was done. I also went about cleaning out the whelping box and freshening up the chips, assuming everyone had arrived. 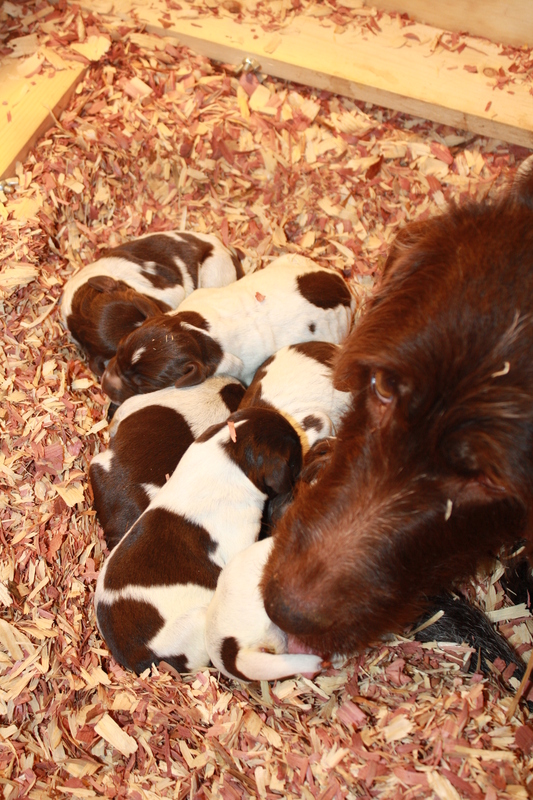 I had an obligation Wednesday morning that I went ahead and attended to, as all of the puppies appeared healthy and Sue had everything under control. 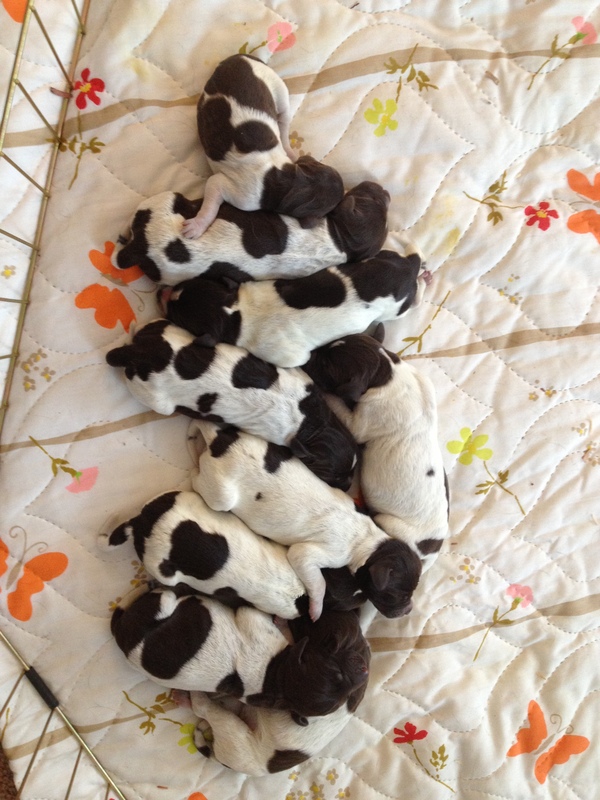 When I went to check in at noon, I knew from past experience that I had better re-count the puppies. Sure enough, a ninth one had arrived. It was limp and cold, when I picked it up at first, I thought it was stillborn. But it was alive, just barely. It had a small, triangular head and was just odd looking, almost like a mole. So, I called him “Mole”. 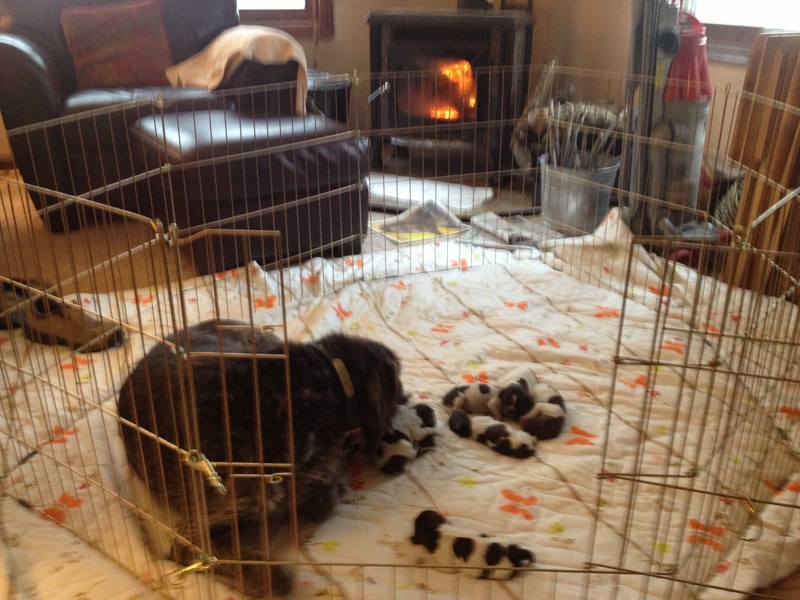 Sue and 9 pups at noon on Wednesday. “Mole” is on the far left, turned away from the teats. From my first discovery of Mole, I tried to bring him around. He was too weak to get to the teat and I had to force his mouth open to even take a bottle. No matter how hard I tried he would never get warm, even if I sat right in front of the fireplace and rubbed him as much as I could. Every time I went to the box, he was pushed over into a corner, cold and alone. I really knew something was off when I finally did get him on the teat, as he was strong enough to suckle, Sue pushed him and my hand away. I had made the appointment to get the pups tails docked and dew claws removed at the vet’s office on Thursday morning at 10:30 AM. Before we made the transition out into the big world, we did a small one into the living room, just as something in the interim. Plus a warm fire is always nice. Puppies enjoying time by the fire before the vet’s office. I really adore my veterinarians, Drs. Andrew and Susan Kliewer of Heartland Animal Hospital. Of course it is cool to work with another husband and wife team, but the best part is that I just feel like we share the same philosophy when it comes to animals and we really “get” each other. So I showed Susan “Mole”, I talked about what had been going on, my concerns and interventions. She told me that she had a friend who had recently nursed a pup like “Mole” back to (what was thought to be) health, only to have it get kidney failure at 6 months old. The persistent coldness showed that he had poor circulation, he had a strangely shaped palate, an improperly shaped skull…there were just too many problems to overcome. So we elected to humanely euthanize him. I really appreciate all the support from my dog friends on Facebook when that happened, it helped me feel better. I knew it was the right thing for the puppy and for the breed and for myself (I was spending the majority of my time, including getting up a night, fussing over him), but it was still sad. 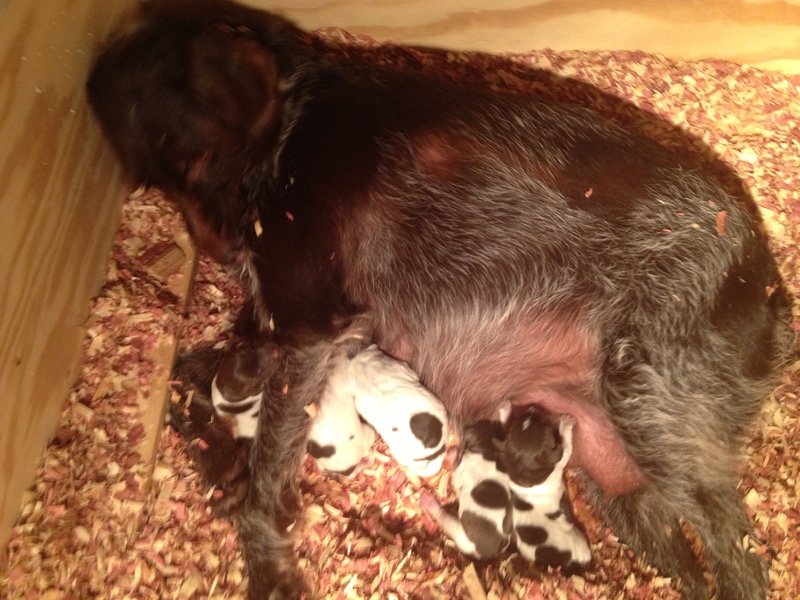 8 healthy puppies at 2 days old! So now everyone is good, Sue included. 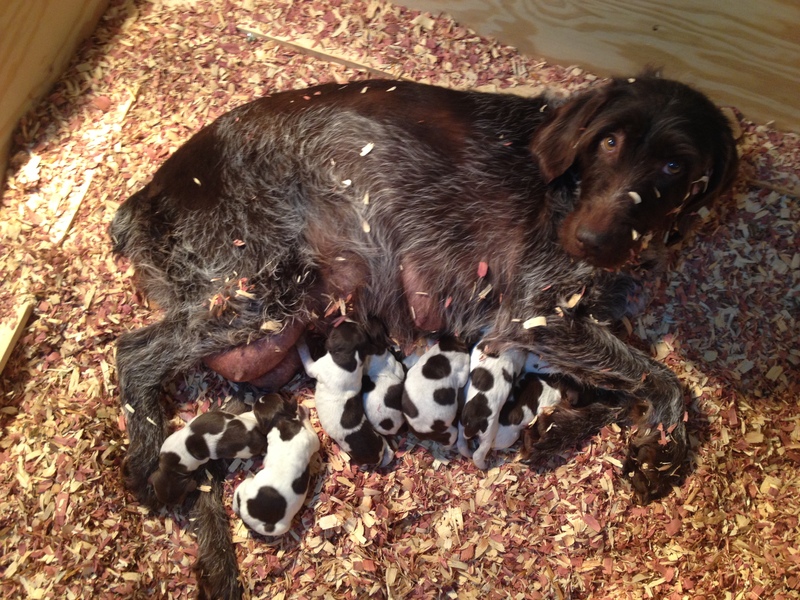 She seems very relieved to have all of the puppies out of her belly. She can go back to trying to catch the squirrels in the backyard when I let her out. Sue looking svelte waiting to come back into the house after a run in the backyard. 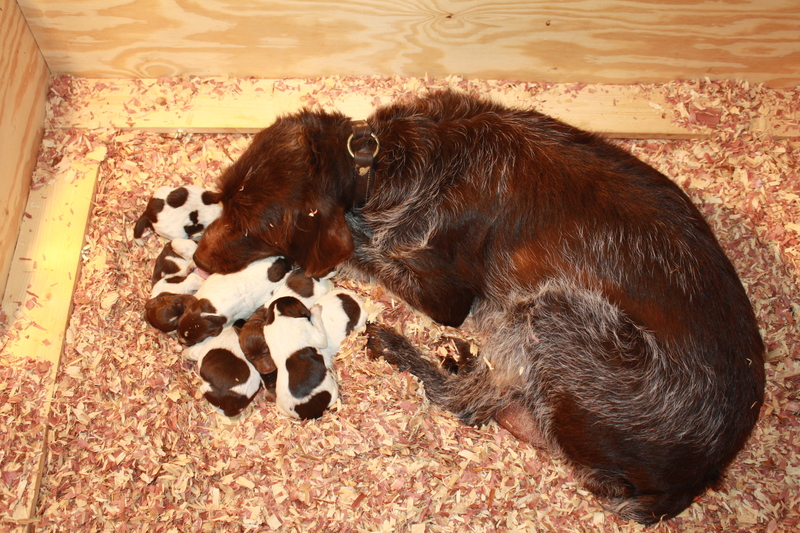 She even felt secure enough today to come upstairs and visit me while the puppies were taking a nap. That made me happy, as the first day I always have to feed and water her in the whelping box because she doesn’t want to leave them. Sue came up for a visit while I blog at the kitchen table. She brought me one of the kids sweatshirts. 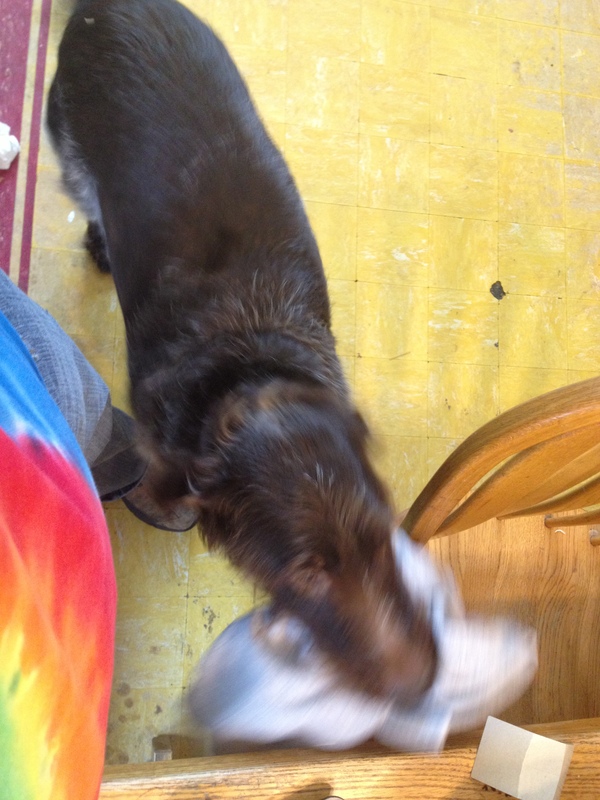 Well I need to get my rear in gear, the German Shorthaired Pointer Club of Lincoln’s cutoff for next weekend’s AKC hunt test is tomorrow at 6 PM, so I have to hustle to get our entries in. BB and Sam are going to do some Senior Hunter runs. 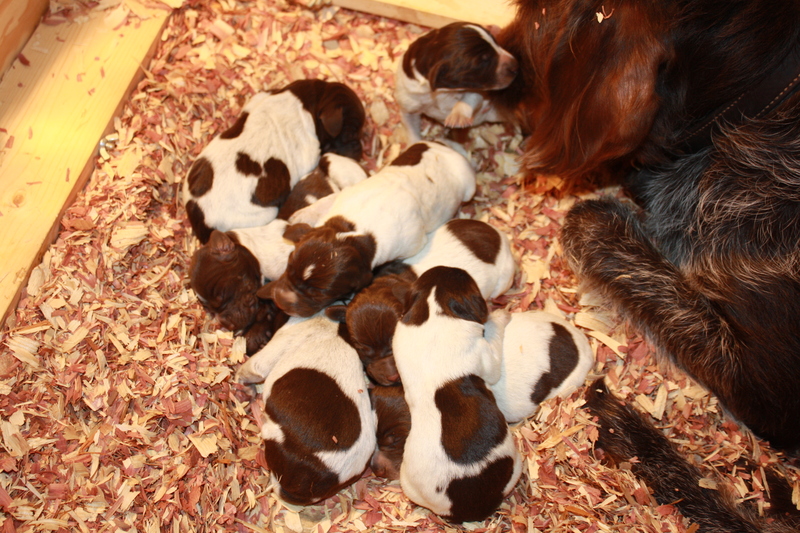 I’m hoping that we can get Rick’s pup “Dottie” from Sue and Sam’s “D” litter last year signed up for Junior Hunter too. Should be a great weekend reuniting with the local dog crazies at the first event of the year at Branched Oak Trial Grounds. I’m excited that they are having a 100% walking stakes only (no horseback) AKC field trial that weekend too. Love to see the foot hunting dogs get some respect. 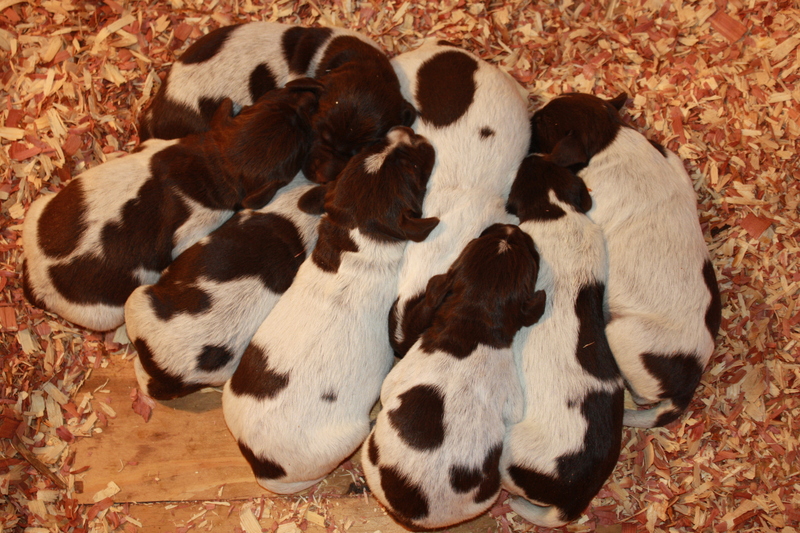 Oh and I do have a pupdate, from TracHer in North Dakota from our “C” litter last year out of Mae and Sam. Tom and Susan got a GoPro camera that Tom is wearing here on his chest while he’s cross country skiing with Susan and the dogs. 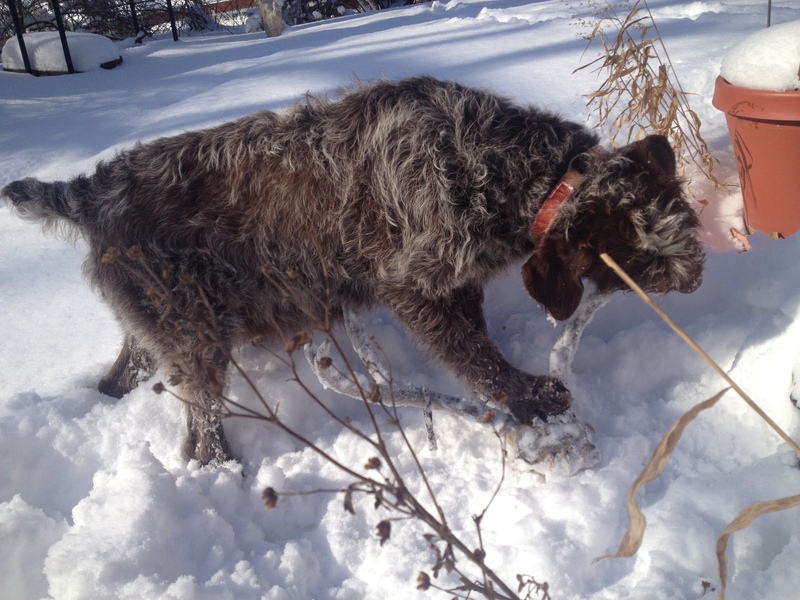 TracHer is almost a year old and looks like she’s having a great time snow diving! That’s one of her griffy buddies Zephyr along with them. 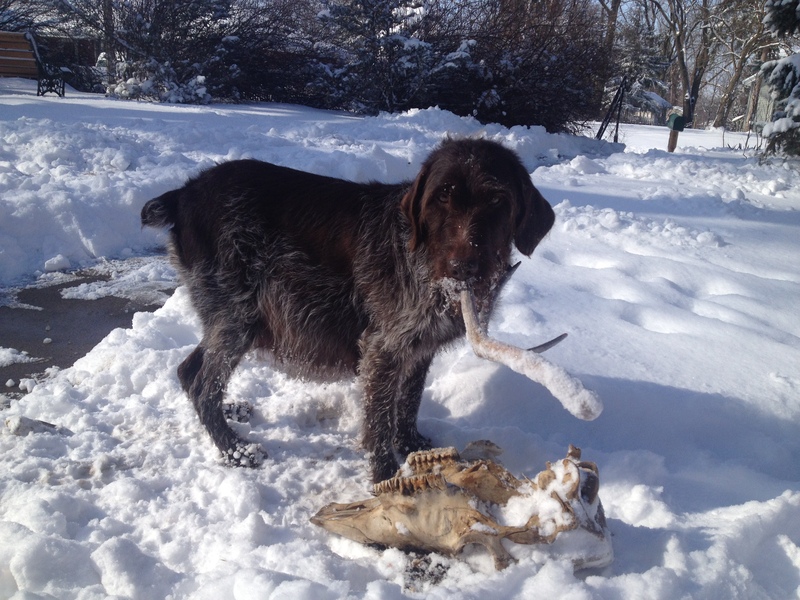 Mae sporting a puppy belly as she chomps on an antler Saturday.